Beijing culinary centennial icons are revered “Laozihao” (老字号) establishments. Known as gastronomic exceptional restaurants showcasing almost every region of Chinese cuisine in the capital city. The title translates as ‘old brand’names¹. 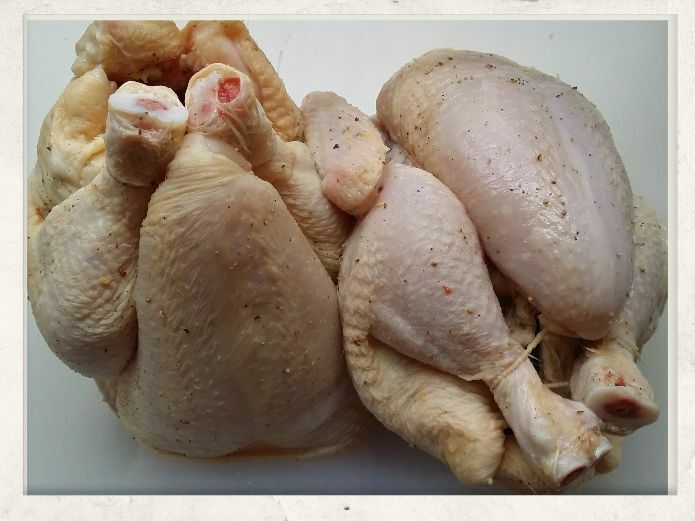 Each in its own uniqueness representing a high level of culinary art by remaining true to its origin. Stumbled upon an older article mentioning the city’s eponymous duck and the city’s oldest surviving restaurant. “Bianyifang Kaoyadian” established in 1416, the premise originally began as a takeaway. The first characters of the Chinese name ‘Bianyifang’ roughly translates as “convenient to everyone” roast duck shop. After reading the article, my own memories unfurled of an earliest family home trip in 1981. Unbeknownst to me at the time, I visited a few of these iconic Beijing culinary centennials establishments. One of them is the now well over 200 years old Yueshengzhai Restaurant. The most famous and oldest Muslim establishment in the capital city. Doors opened in 1775, by a former servant at the Qing Imperial court named Ma Qingrui. 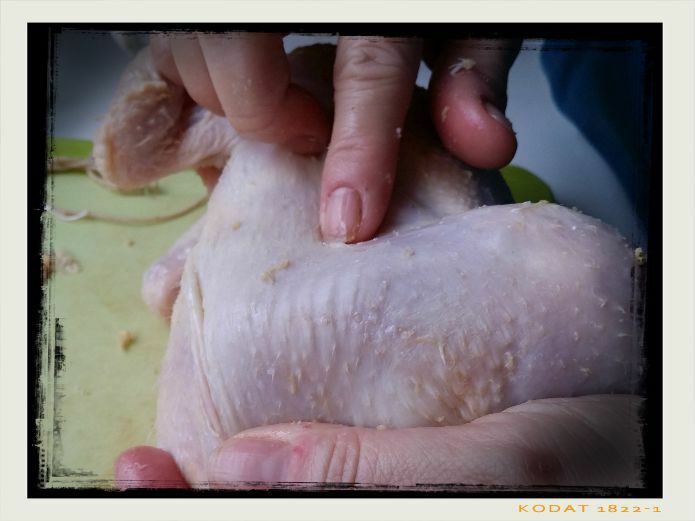 Six generations have continued and followed the traditions after its founder. “In 2007 Yueshengzhai’s received recognition for processing techniques for braised mutton with soy sauce. 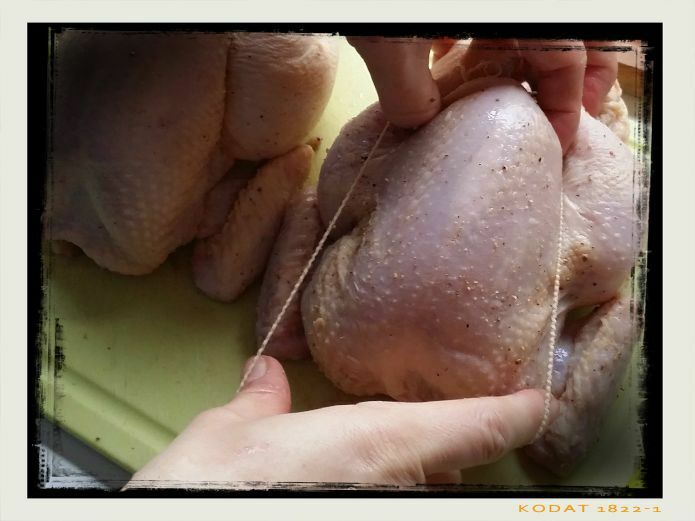 Most noteworthy citing the high standards of guarding the quality of meals. 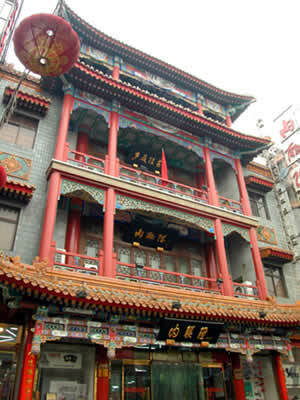 An integral part of Beijing’s Intangible Cultural Heritage.” Source: btmbeijing.com. 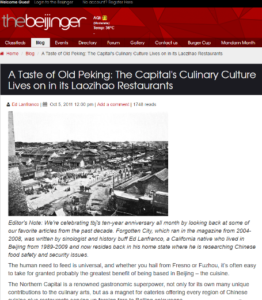 For more in-depth information featuring “The flavour of the capital” (Jingwei’r) click here on the China Heritage Newsletter link. The link includes an appendix with halal related snacks and dishes in Beijing. The food keeps drawing local devotees and visitors to the same place. With each visit renewing one’s palate is a feast of confirmation and merit reminiscent to old Peking. One of the featured dishes is “Baodu” made from intestines and what I ate at my second visit to Beijing. 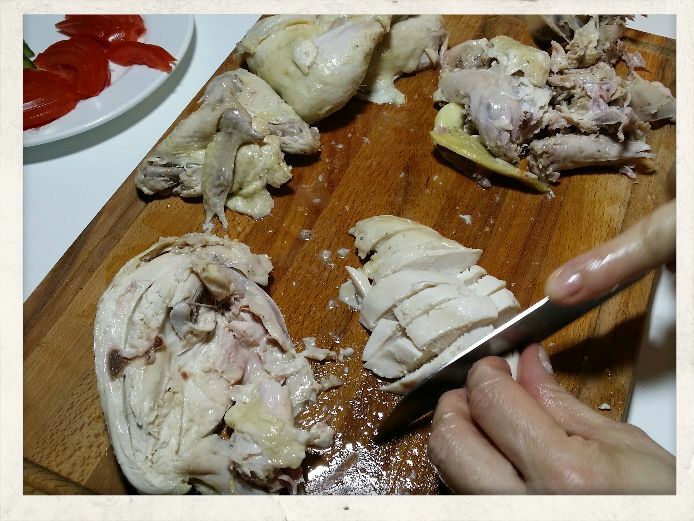 The thin slices were meltingly tender and aromatic. Tripe if not cooked and seasoned correctly is unpalatable and rubbery. What surprised me was the hot-vinegary tart sauce and use of cumin. A spice which is not common in the south-eastern cuisine (my family originates from Zhejiang province). Cumin founds its way by caravan trade into China north-western regions Xinjiang, Mongolia and Hunan cuisine. Among culinary centennial discovery was seeing and enjoying the copper chimney firepot “Huo Guo”. This cooking pot dates over 1,000 years with the origin being from Mongolia. Fuelled by charcoal heating the broth to a slow simmer with the smoke escaping through the chimney. China Northern cuisine is represented by the mutton hotpot by using sheep (lamb) bone stock as broth. Most of the copper chimneys have disappeared, replaced by digital electrical cooking pots. 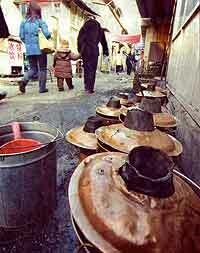 The cooking pots with steaming hot broth have a variety of choices of basic Chinese meat, fish or seafood stock. Varying seasoning of MaLa (lip numbing hot!) or herbal infused and more. Will mention my favourite book choices in a separate post with recipes to prepare your own tasty & healthy hotpot dinner(s). Other cultural influences by neighbouring cuisines as Thai, Korean based stocks appear on the menu. A new cooking vessel is known as the YinYang or Double duck to serve a spicy and non-spicy version. 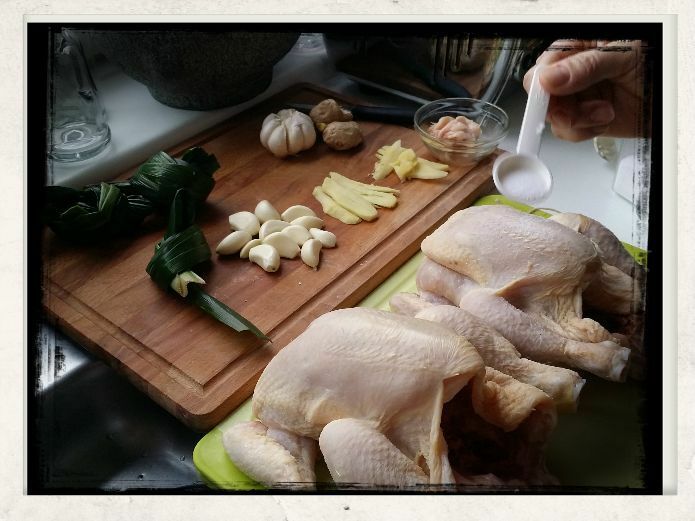 This new design serves double broths, is a big hit as a home cooking utensil and restaurants serve ware. For our international readers the above serve ware can be ordered online, but for Dutch readers and foodies, both items are on sale at Chinese Supermarkets e.g. Dun Yong Amsterdam, Wah Nam Hong The Hague and Amazing Oriental in Rotterdam. 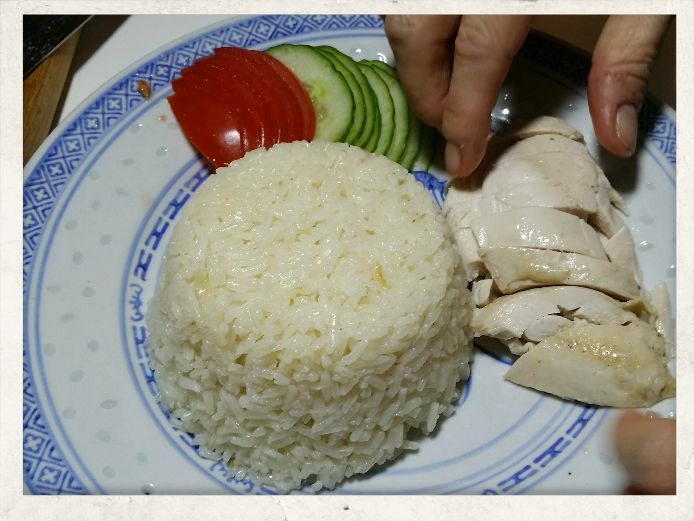 This post contains affiliate links by purchasing through these links Asianfoodtrail earns a small commission to support and maintain the website. However, you pay the same price for the item (it does not increase). Please note promoted links to products are purchased, used, tried and tested unless stated otherwise. For more information, read my disclaimer. 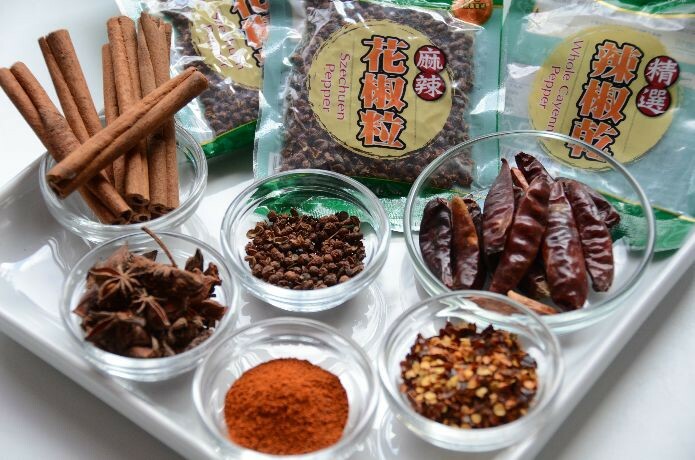 Ma La 麻辣 spices and spiciness, the lip and tongue-numbing heat of spicy Sichuan peppers in many dishes and sauces in Chongqing and Sichuan Cuisine. Embraced by lovers and fans of hot and spicy food also referred as La Wei 辣味. A favourite winter dish is Ma La Huo Guo 麻辣火鍋 or fiery Chinese Hotpot. The first time we had Ma La Hotpot, by chance we ordered a Double Lovers Hotpot since the kids joined for dinner as well. This variation is named Yuan Yang Huo Guo 鸳鸯火锅 or Mandarin ducks, representing male and female, yin and yang perfect harmony of warmth and cold. Which explains the common use of reference as Double Lovers Hotpot. An inventive vessel next to the chimney type Hotpot, because the Double Lovers Hotpot has a divider containing a regular stock and Ma La broth sided together. 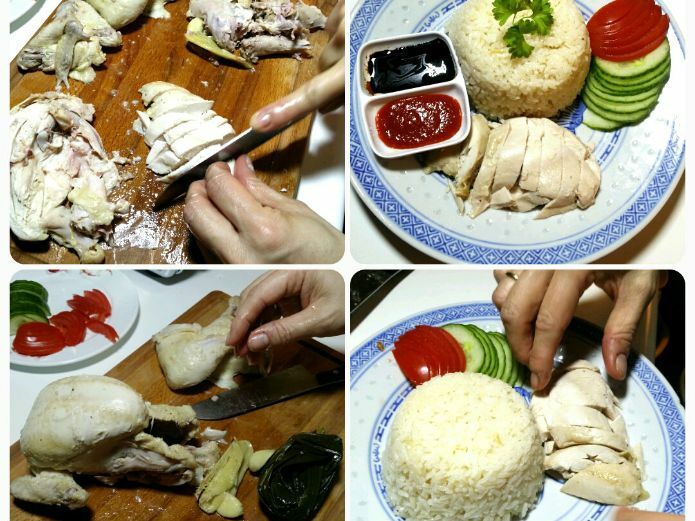 Now in China and other Asian countries, you might even come across specialised fondue restaurants with quadruple pan holder for broth variations or including a grill for barbeque food. Chinese people all over the world consider it to be the most important part of the celebration. 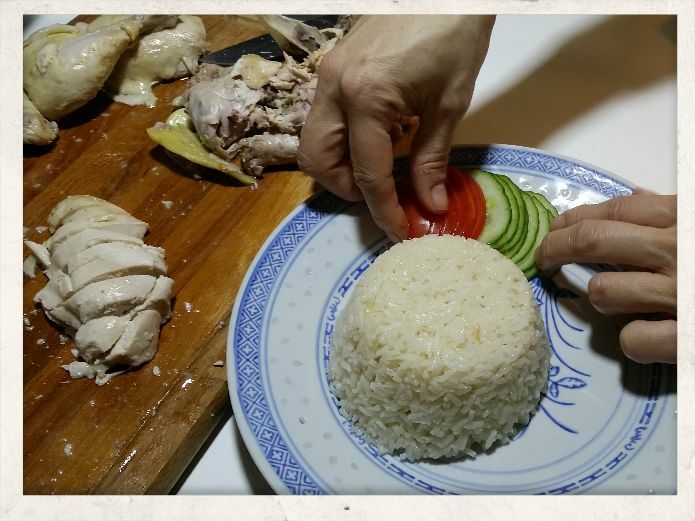 The reunion dinner literally meaning re-unite or grouping and 圍爐 Wei Lu which translates as surrounding the fireplace marks a family gathering on the Lunar New Year’s Eve. Wei Lu 圍爐 symbolising the family gathering with a prolonged Hotpot as family members arrive one-after-another. 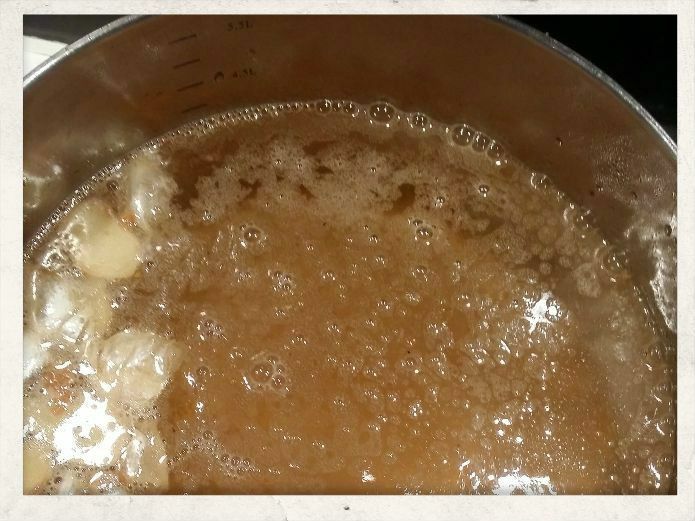 First obviously as a soup, a base of meat stock made from one or mix of lamb, cow, pork or chicken bones simmered for hours to release nutrients and marrow with additional herbs and vegetables aiding extraction and enhancing the final broth. 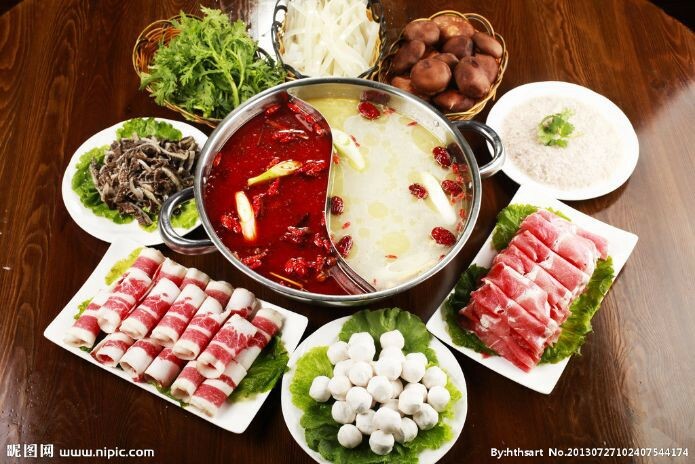 During the course of the dinner, the Hotpot will be refilled several times with the prepared broth. 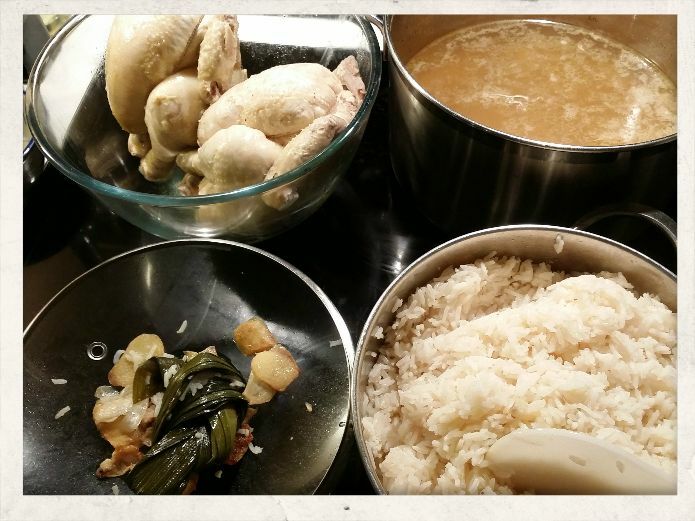 Added bonus once dinner progresses all the additional food items dippings will release more flavour to the broth. The dipping sauce condiments to create or blend your dip mixture to your own liking and preferences. 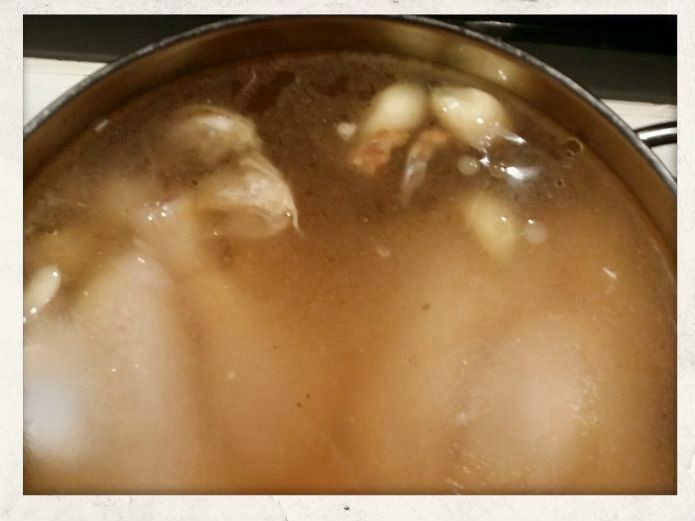 For all intent and purposes, the various plates ingredients after being cooked in the Hotpot broths are dipped in your sauce before being savoured or wolfed down. Often used sauce components are; diced garlic, Sa Cha Jiang 沙茶酱 (a must), sliced green onion, chopped coriander, chopped ginger, salt, sugar, chilli slices or diced, Chinese vinegar, soy sauce, oyster sauce, sesame oil, vegetable oil, and chilli oil. While the broths are important so are the many accompanying ingredients of thinly sliced meats, fish and seafood, vegetables (typical Hotpot veggie is Tong Ho aka Chrysanthemum greens), doufu (dried, soft and hard) and variations of hotpot dumplings, doughy items e.g. Nian Gao 年糕. 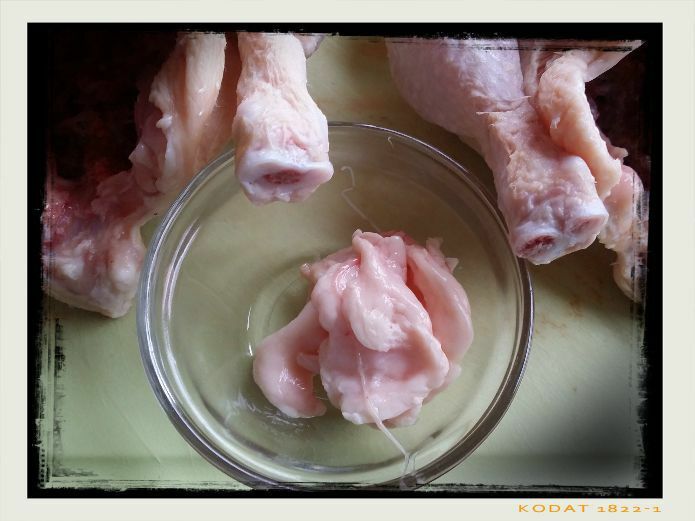 And often offal items are included and seen as a highlight for many Asian and less for the general Western palate. 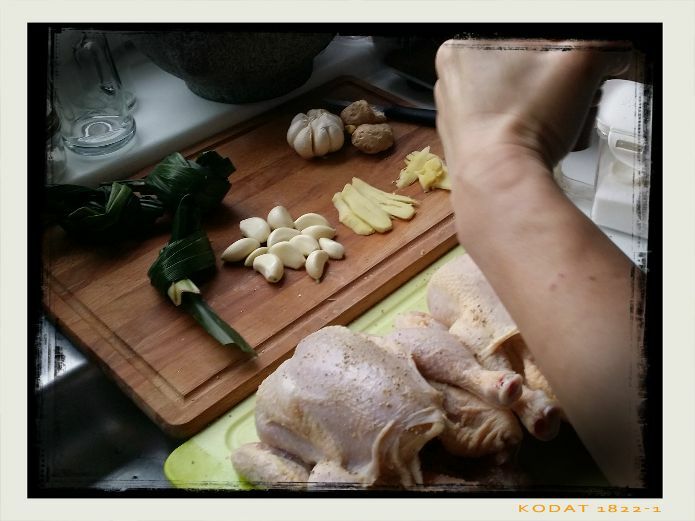 Just remember an easy rule of thumb; 5 vegetable dishes and 5 meat/fish dishes is a good start. Let me guarantee that life will never be the same after sampling Ma La sauce or hotpot, it is one of the most popular and sociable dinners in China and Taiwan. Your sensory taste buds will be nuked while experiencing the sauce or soup unique flavours at the same time. 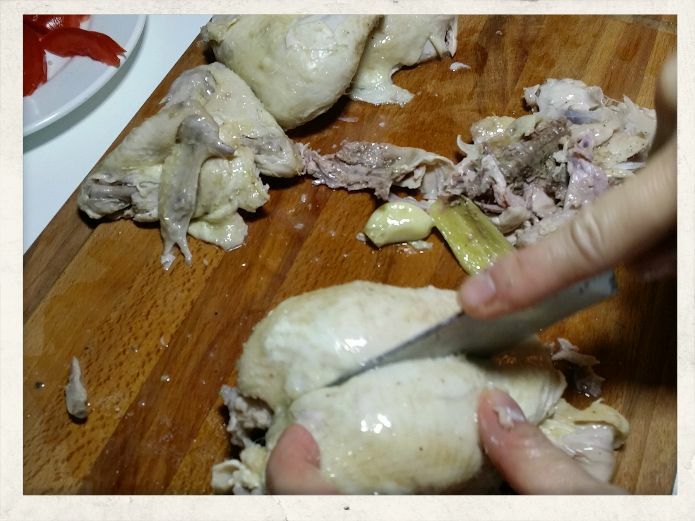 If you cry, you are in great company joining your culinary merriment in howls and other spasms. 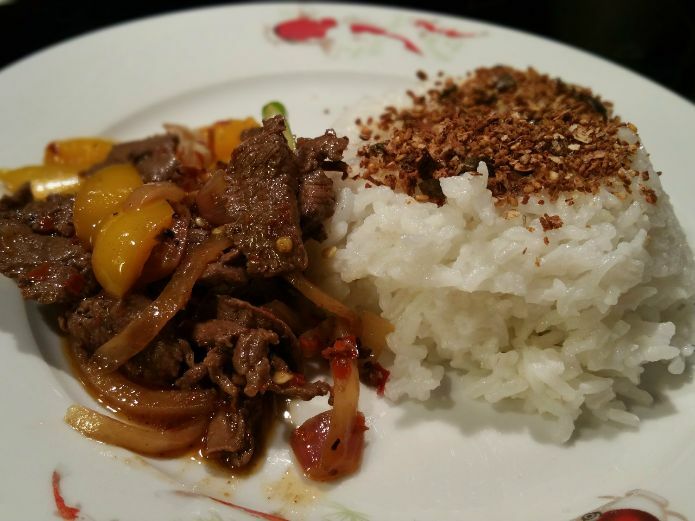 While every Chef or household has its own recipe, the main ingredients are dried chilli peppers; La Jiao 辣椒 (dried Sichuan pepper) and Hua Jiao 花椒 (has a unique aroma slightly lemony tone and a tingling mouthfeel) next with chilli powder, cloves and use of black cardamom. 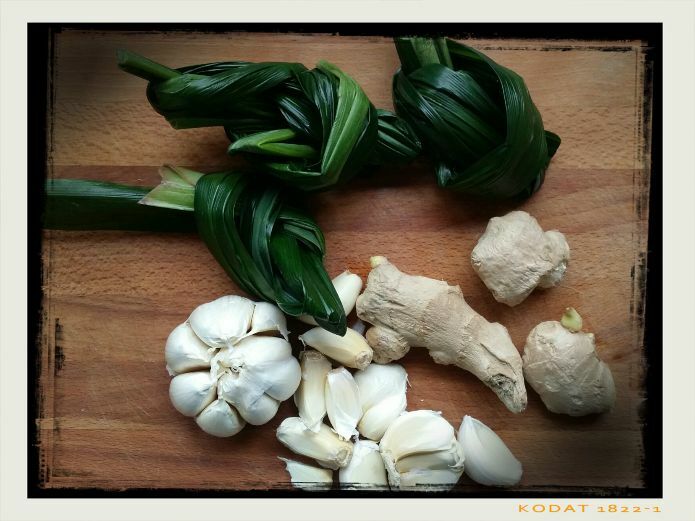 Related to green cardamom, but bolder and stronger flavour with notes of resin and camphor, mostly used in curries (Indian), stews and meat broths in Chinese and Vietnamese Pho. Other spices are fennel seed, cinnamon, star anise and typically Chinese herbs Sha Jiang 沙姜 (in Indonesian cooking aka kencur, aromatic ginger it has a peppery camphoraceous taste); Bai Zhi 白芷 aka Angelica root or Chinese Angelica often used in stewing soups for restorative medicinal purpose as a tonic. 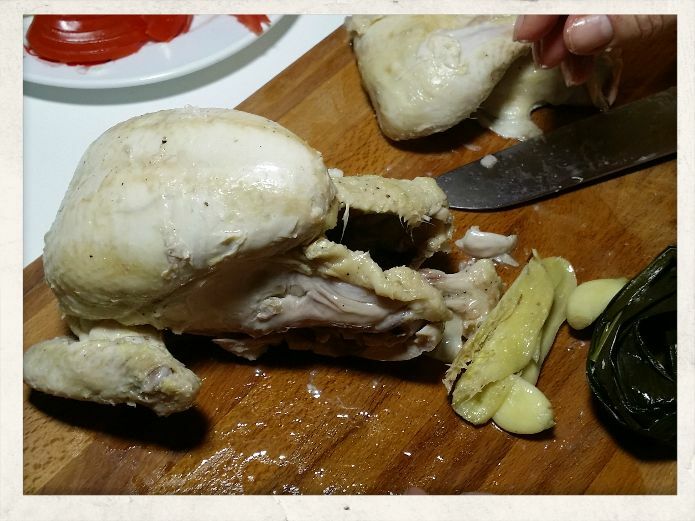 Nowadays Ma La sauce is premade ready and sold in Asian supermarkets or Chinese food stores. Sichuan restaurants will often make their own sauce blends in large quantities, as will home cook aficionados. 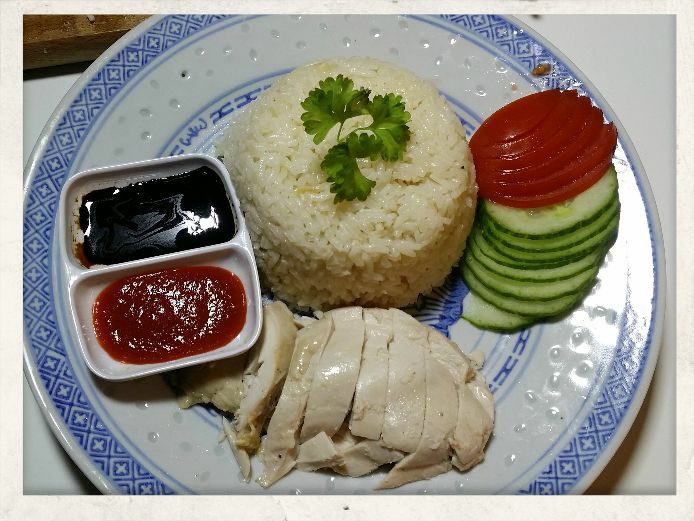 Add to this the number of travellers who will return home and develop comfort food cravings starting to search for recipes or scouring their city for an authentic dish to recreate and/or rekindle the wake-up feel by Ma La spiciness on their tongue and lips. 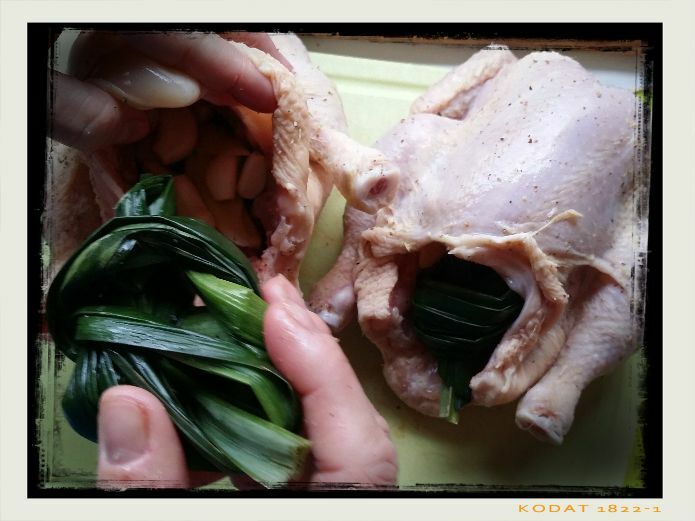 The MaLa Project literally chases Mala prickling and tingling spice in food and life by Taylor Holiday runs a great blog exploring authentic Sichuan dishes and recipes. 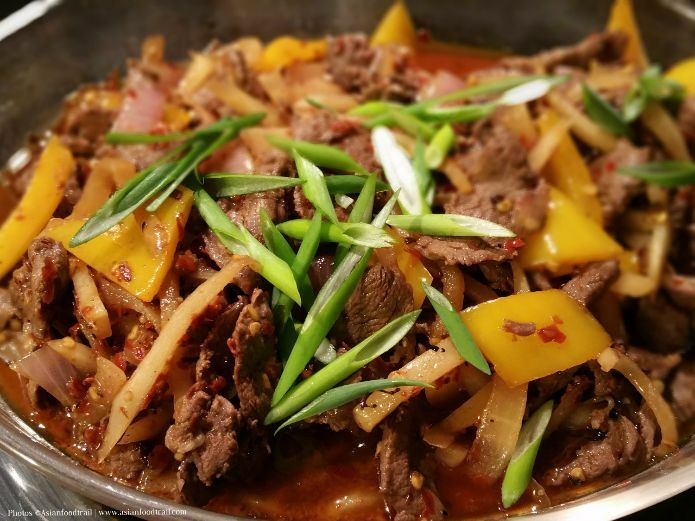 Since it’s still winter season we have the Wild game on the menu, here’s a dish Spicy Hare stir-fry regional Sichuan style recipe. 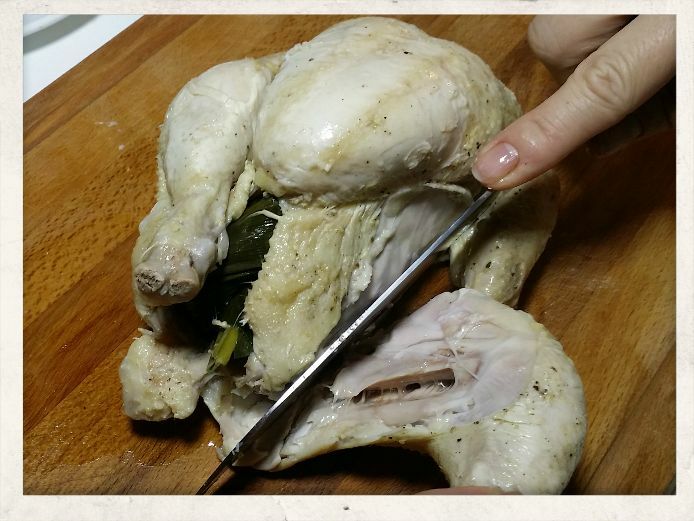 Give it a try and adjust the spicy level of heat up a notch or keep it burning low and slow. The flavour is spicy, numbing brought on by Hua Jiao (flower pepper aka prickly ash) and salty, mixed with a strong herbal taste which is often described as savoury, spicy, complicated and addictive. The international pungency measurement for the level of spicy heat of chilli peppers is the Scoville scale heats unit (SHU). A practical measurement determined by the capsaicin sensitivity of testers and not a precise or accurate method to measure scientifically capsaicinoid (a volatile oil in peppers) concentration. This method is created by American pharmacist Wilbur Scoville in 1912. 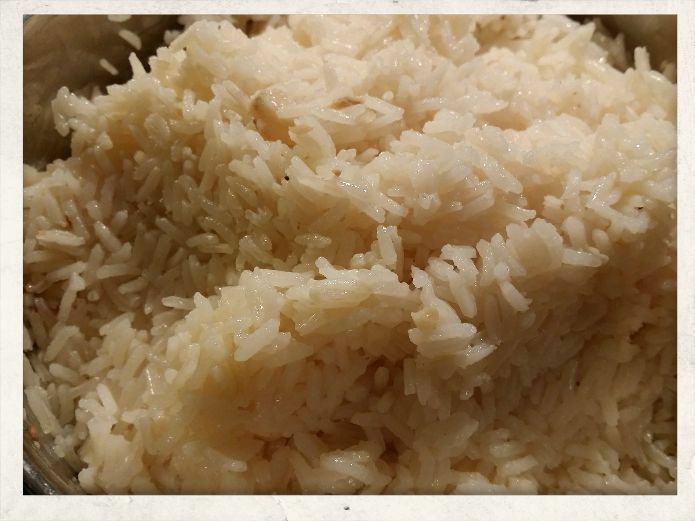 Since its origin using real testers you will often see in signs or advertisement the progressive faces of compliant up to screaming and teary faces or the number of peppers behind a dish or ingredient. For those who are curious to find out how scientist measure spiciness now, check the link here for more information or browse to read more on a different measure of pungency units here. How hot Ma La 麻辣 spices, as Sichuan peppers in La Wei 辣味 are can be viewed in the China challenge: Eat ‘World’s Spiciest’Rice Noodles original by NetEase|163.com as posted by Wall Street Journal Video Channel. Entertain your Hotpot with family and friends at home or find a great Chinese Restaurant, take the challenge add some spice into 2016. Last August I read online the excerpt here below of Let 100 Voices Speak. 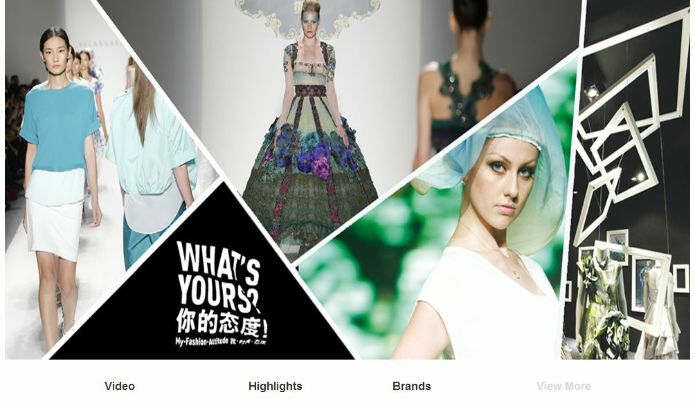 The title and content focus on how social media flourished and has taken China by storm. Also, the various correlations the writer points out between the past and present e.g. on movement, dissidents, targeting of influential intellectuals. Internet censorship in China is extreme, authors and publishers are under pressure appeared as a headline news article in the Guardian just a month ago. Novelist Sheng KeYi had written a best-selling breakthrough novel over a decade ago, but while preparing the third edition she was informed that parts of her texts were not publishable. 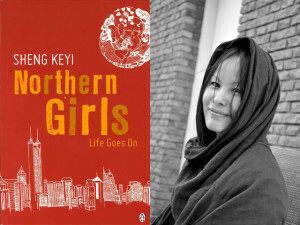 In her book “Northern Girls” she writes about the problems of society: the “injustice, the inequality, and the darkness”. The author tells the story of Poor Chinese Women to critical acclaim, review by The New York Times. 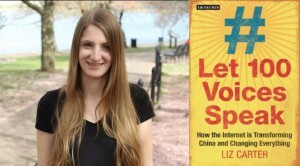 Let 100 Voices Speak, on “The Darkness”, Liz Carter answers to a question whether she was active on China’s social media as an outsider looking in and what spiked her interest. LC: It’s hard to pick just one thing, but I love Chinese Internet humor. It’s so complex, and references a lot of shared knowledge, and it can be very, very dark. Humor is under-appreciated as a form of protest and resistance, especially humor in China. Part of this is because humor is so hard to translate. 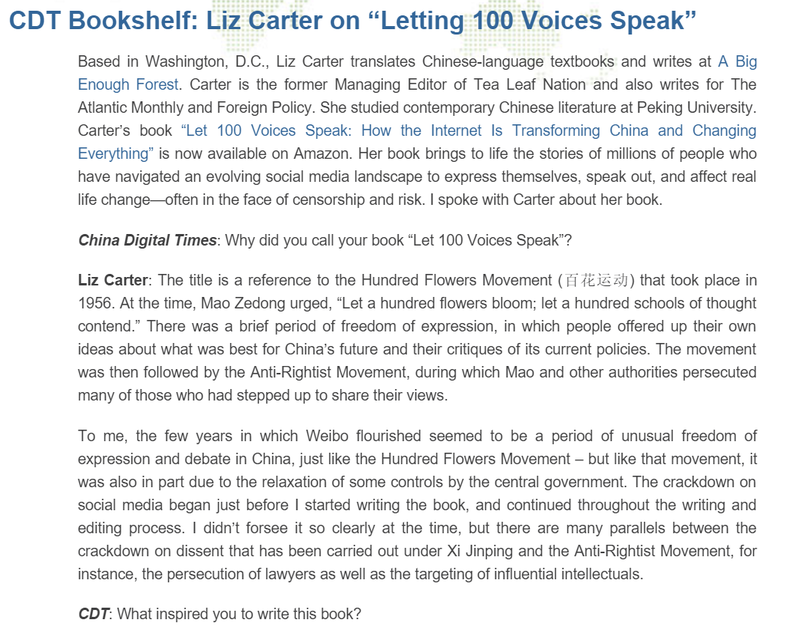 By author Liz Carter, she is the author and translator of numerous Chinese-language textbooks and the co-author of The Grass-Mud Horse Lexicon. Article by Natalie Omell originally posted on China Digital times – Highlights excerpt here below or read the full article click here. Live feed on my screen flashing the latest internet headlines blurbs of today. Focusing on China, real life time changes in the face of censorship and the visible pressure clamping down on social media. The information reminded me of having read the book excerpt earlier and seeing the correspondence in real life occurrences. For me, what comes to mind are keywords as in hashtags; #social media, #China, #transformation, #lifestyle, #femalewriters #newwriting #information not readily available, the more reason to learn more about. 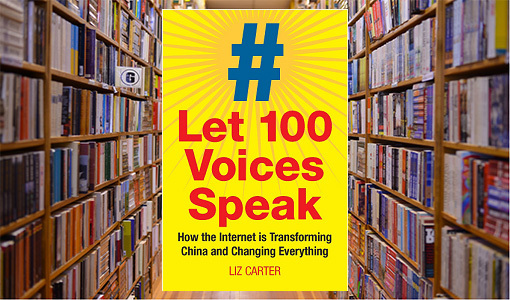 Let 100 Voices Speak: How the Internet is Transforming China and Changing Everything, the role of social media. Northern Girls; Life goes on. Best-selling Chinese novel one of the few translated Chinese fiction books in English. Words are written in raw candour showing a slice of life, the harsh reality where little town village girls are leaving home for the bigger cities to be drawn into the depravity of a seedy cesspool. Hidden dangers nobody wants to see or talk about. The book links here above are “affiliate links.” This means if you click on the link and purchase the item, I will receive an affiliate commission. Thank you for supporting Asianfoodtrail when you shop. Last year after Spring Festival in March we were travelling around Guangdong and Zhejiang Province in China. The masses of travellers and passengers which are transported on a daily basis is incredible. Here in The Netherlands we often grumble and complain about NS, the Dutch railway company, about train delays often signalling problems or other service disruptions. As a passenger, you don’t want to be stranded anywhere (Train and Rail Travel info in The Netherlands). However, it is just a drop in an ocean if you see the number of people travelling in China using public transport as buses, MTR’s, train stations, domestic and International airports “humongous”. With 10.276 million riders every day (Daily Record) and transporting 3.029 billion people travelling Beijing Subway last year 2013! Today China boasts both the world’s longest and second longest metro systems. Out of the top 10 busiest metro systems in the world 4 of them are in China. The first subway in China was built in Beijing in 1969. The Tianjin Metro followed in 1984. Since 2000, the growth of rapid transit systems in Chinese cities has accelerated. The Shanghai Metro despite being the world’s longest only started operating in 1993. From 2009 to 2015, China plans to build 87 mass transit rail lines, totaling 2,495 km, in 25 cities. Source: Wikipedia Urban rail transit China. As another netizen pointed out, it’s good to have another transportation available for speed besides aeroplanes, which is the CRH the high-speed train or a.k.a bullet train. Analyst says that Beijing-Shanghai railway is not in competition with Airlines. Unfortunately, China has had a major train disaster on July 23, 2011, a high-speed train collision in the suburbs of Wenzhou. Read full articles Wenzhou crash report and Wenzhou train collision clicks on the highlighted links. Rail, which is the primary mode of transport, has doubled in length since the mid-twentieth century, and an extensive network provides service to the entire nation. The larger cities have metro systems in operation, under construction, or in the planning stage. The highway and road system also has gone through rapid expansion, resulting in a rapid increase of motor vehicle use throughout China. Although China’s transport system comprises a vast network of transport nodes across its huge territory, the nodes tend to concentrate in the more economically developed coastal areas and inland cities along major rivers. China Railway High-speed (CRH) is the high-speed rail service operated by China Railways. Hexie Hao (simplified Chinese: 和谐号; traditional Chinese: 和諧號; pinyin: Héxié Hào; literally: “Harmony”) is the designation for rolling stock operated for this service. Transport in China has experienced major growth and expansion in recent years. Airports, roads, and railway construction will provide a massive employment boost in China over the next decade. Source: Wikepedia. Ordering or buying train tickets can be a cumbersome and frustrating process, at the bottom you will find how-to links and information to make reservations and order online in advance. Thirty-two new bullet train routes will start operation next month, linking Shanghai to Guangzhou, Nanning in Guangxi Zhuang Autonomous Region, Huaihua in Hunan Province and Nanchang of Jiangxi Province. All the new bullet trains will depart from Shanghai Hongqiao Railway Station. 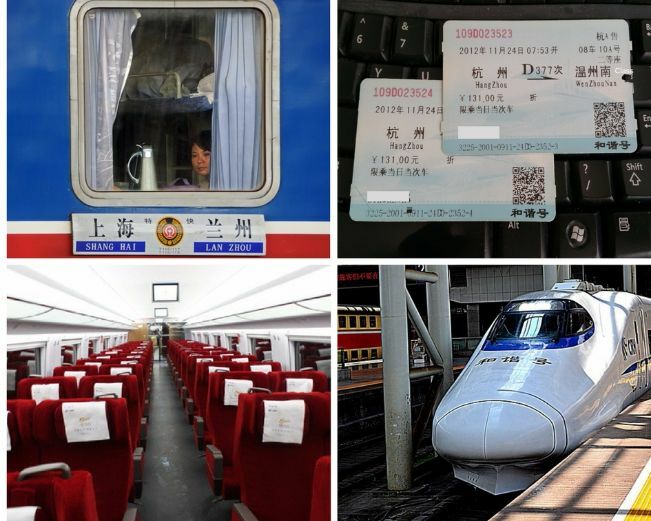 The new bullet train will allow passengers to reach Guangzhou in 6 hours and 51 minutes — nine hours less than the previous 16-hour ride by slow train. 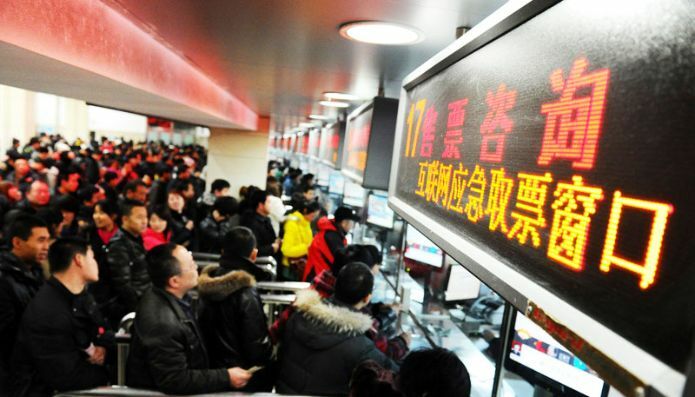 Meanwhile, fast trains to cities like Harbin, Shenzhen and Lhasa will be upgraded to direct trains starting from December 10.
via New bullet train routes | Shanghai Daily. To travel we need transportation and we travel in huge numbers, hence the need for fast mass-transportation. Passengers already travel faster than a horse, car, bullet or standard train or by plane. Typical consumers argument “faster and cheaper” its never enough. Because for as many supporters there are as many opposers fighting for environmental preservation, loss of habitats etc. In all honesty and fairness if we didn’t have our modern means of transportation. We would not be able to travel the world as often and conveniently as we are used to in the last quarter of twentieth into the twentieth-first century. The ShangHai – Beijing bullet train has broken a world speed record, hitting a top speed of 486.1 kilometres per hour in a test run by CNN Travel. 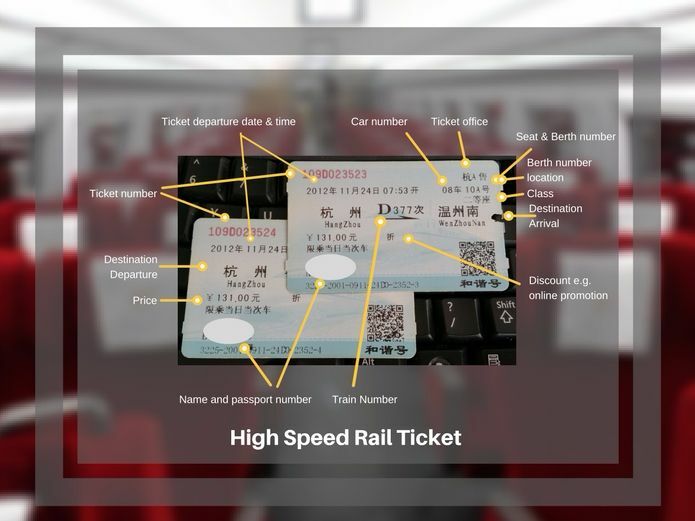 CRH tickets are compared to Dutch and European high-speed railway very cheap, but in China relatively expensive. Travelling around China on the CRH is very modern, fast, clean and excellent service on board. We travelled from Hangzhou to Wenzhou in 4 hrs, the standard travel time would be 8 hrs according to the train schedule. More than 25 years ago I travelled the same distance and it took us around one and a half day by ferry boat disembarking on the wharf. Compared to those days this is a science-fiction reality, as for the present progress it has its ups and downs. Travelling speed and comfort are here, choices are offered how you want to spend your money and time on the road. 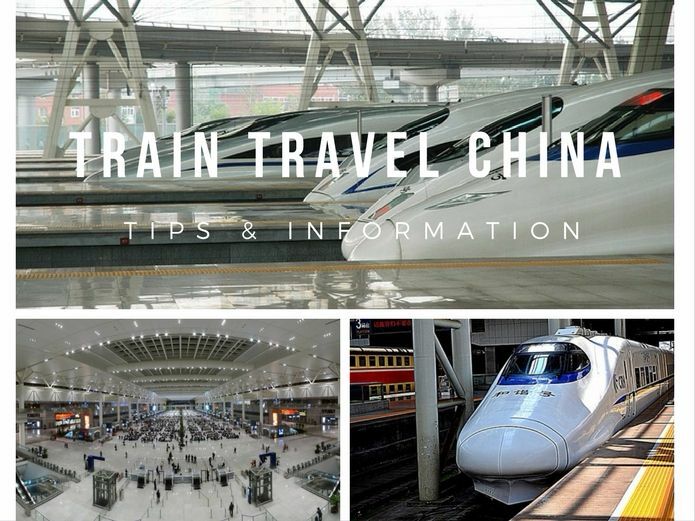 If you have plans visiting more places and provinces in China, travelling on high-speed train or bullet trains is a comfortable and very convenient option to be transported to the heart of coastal city centres. The train coaches, seats and aisle are in comparison to domestic or continental aeroplanes more spacious. When booking hotels check on free airport pick-up service. Be prepared that the masses you are travelling with are going through the same exit. The stations are huge, so it was not a surprise we had to walk a fair distance to arrive at the taxi stand to join the long waiting line. Easily adding an hour for taxi service so plan this ahead in your itinerary. Travelling on the bullet train is very convenient, fast, affordable and for long distance service on board is great. In comparison with aviation service, I might incline towards travelling on the bullet train based on the pleasant travel experience we had. 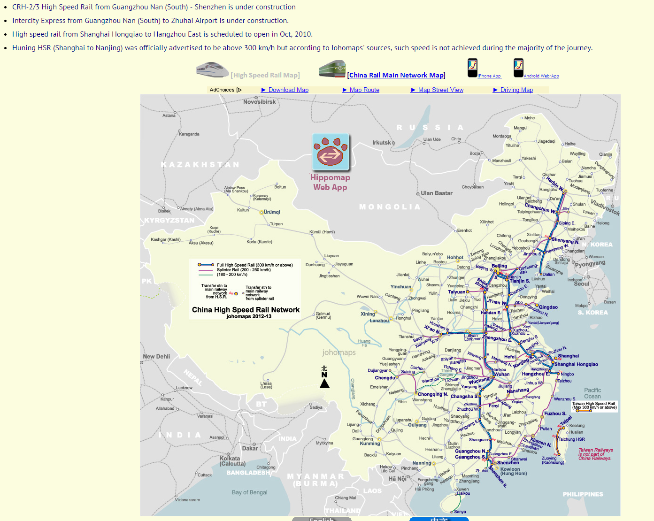 Wiki How Travel in China by train safely Information on this Wiki How-to page is inaccurate, as rightly commented by experienced China train travellers. In laboratories and startups across China, tinkerers with big dreams are pushing what many in the industry see as a potential new wave of Chinese innovation. 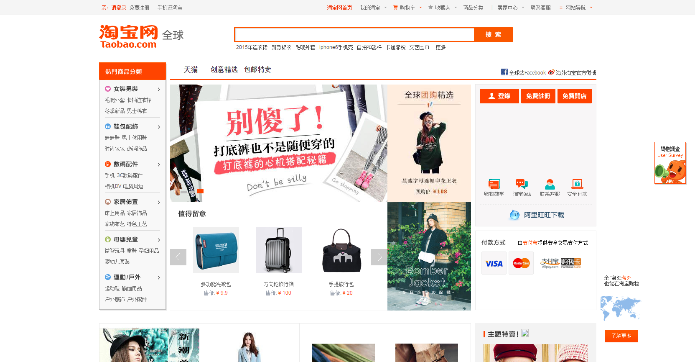 They see smart gadgets—wearables and other devices that connect to the Internet or interact with users—as an opportunity to create a Chinese-designed product for a global audience. China is betting heavily on innovation as a way to help its economy develop beyond its traditional reliance on factories, exports and government spending. At a meeting of lawmakers in March, top Chinese economic planning officials called for development of a new generation of smart gadgets as part of a broader effort to emphasize cutting-edge technology. China has invested in areas to help that process, such as a pledge this year to spend 120 billion yuan (nearly $20 billion) over an unspecified period to build its nascent semiconductor industry. 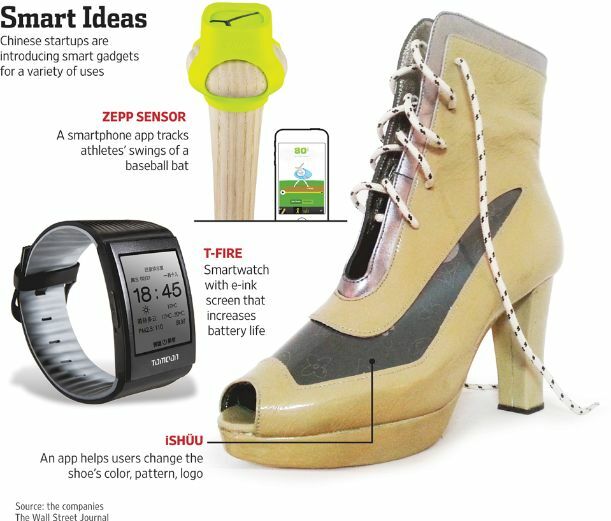 Read full article via Chinese Gadgets Signal New Era of Innovation – WSJ. 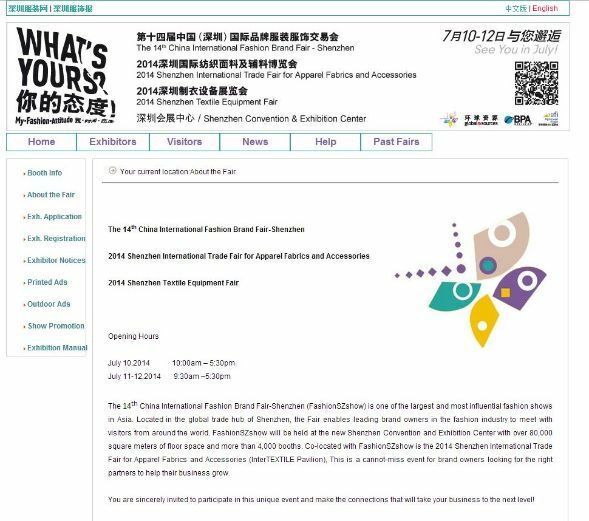 via The 14th China International Fashion Brand Fair — Shenzhen opens today – MarketWatch. 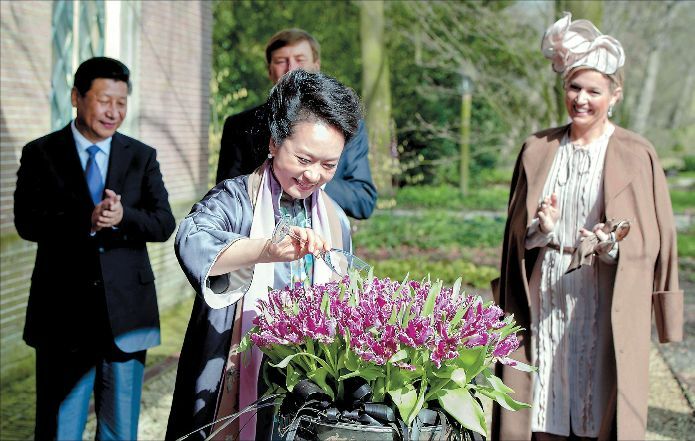 Peng Liyuan, the wife of the President of China Xi Jinping named in the presence of King Willem-Alexander and Queen Maxima a special tulip in Keukenhof. 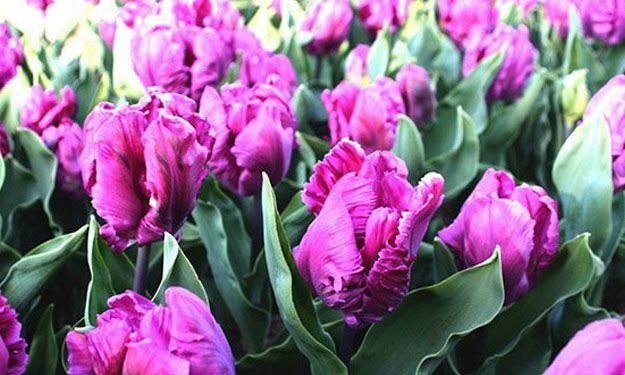 With the name giving ceremony this purple parrot tulip has the name, for eternity “Cathay Tulip”. Peng Liyuan’s “Cathay” tulip debuts in Beijing, click here to watch the video. Ever since China’s First Lady had baptised the new tulip “Cathay”, the new variety has become an overnight sensation. China has a high demand for importing the new cultivated Cathay Tulip and the Netherlands sees a rise in a new export product. The new Cathay tulip is a strong and colourful flower, that can be grown in a sustainable way. Mr Bart Siemerink, director of Keukenhof, already expresses the wish that this is a symbol for the strong, flourishing, and sustainable bond that China and the Netherlands have. If you happen to travel by train along the route Leiden – Amsterdam, you actually have a track view on the bulb fields “bollenstreek” of Lisse, where Keukenhof is located.